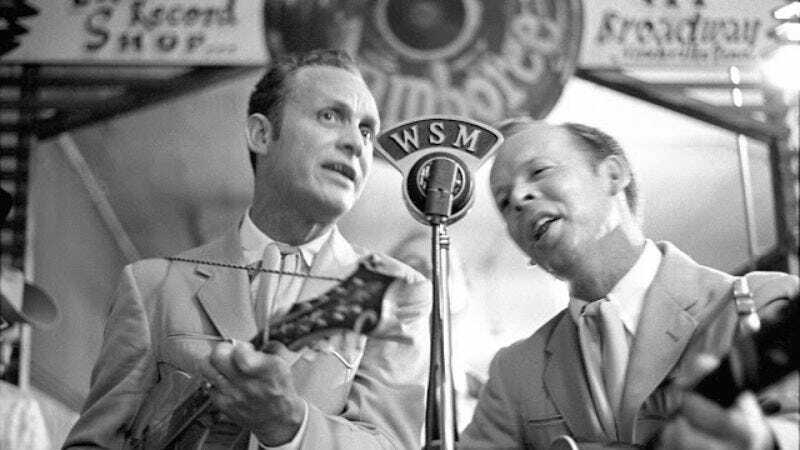 The Louvin Brothers recorded some pretty weird tracks in its 20-plus-year career, from songs about the veracity of Satan to ones about dead lovers. Still, the band’s biggest and only No. 1 hit, 1956’s “I Don’t Believe You’ve Met My Baby” is also arguably one of its tamest. Revolving around a dream the narrator had, the song is the tale of a guy so smitten with his girl that he doesn’t mind “strolling in the evening” and meeting “out in the moonlight” with stars “shining in your eyes.” In his dream, his little lady has another guy’s arm around her. It turns out that said gentleman is her brother, meaning he’s no threat at all, allowing the narrator and the girl get married, and all is great. The irony behind this sweet little song with sweet little harmonies is that at least one of The Louvin Brothers was a bit saltier in real life. Ira, brother to Charlie, was known as a hard-drinking, nasty cheat. He was married four times, and one of his wives, Faye, even shot him six times after he tried to strangle her with a phone cord. He survived, but by that point had bothered his brother so much that Charlie disbanded the group. Both brothers went out on their own, but Ira died in a car accident just two years later, when he and his fourth wife, Anne Young, were hit by a drunk driver. Charlie would go on to live a much longer life, even writing a book before he died in 2011 about his time in The Louvin Brothers. The excellent Satan Is Real: The Ballad Of The Louvin Brothers, came out in January 2012.